I'm here proudly introduce a new member to the HO family, PaKeFiNo! This is it! my dear lil boy! i had a great time camwhoring with it! its so soft and huggable.. gosh! i love it loads. It is very special to me because it is given to me by 4 very special individuals who are pH, Kaw, Narenjit & Fiona. PaKeFiNo is my early birthday pressie from them! so sweet of them kan?! 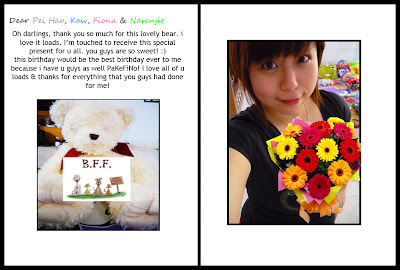 *cry*.. i was so so so touched when Kaw handed it over to me. THANKS DARLINGS! The minute when i opened up the box and saw PaKeFiNo in it.. i was so touched & thrilled! gosh.. this teddy bear is so effing adorable! i cant take my eyes of it and just feel like hugging it the minute i saw it! However, due to the fact that i was still in Uni tat time, i couldnt hug it all around the place because i might dirty it! so i kept it back to the box & brought it home. After the camwhoring session at home, i decided to put PaKeFiNo back to the box as my big day haven arrive yet. I shall wait till 22112009 @ 1159pm only take it out & place it on my bed so it could accompany me to welcome the arrival of 2311! *wee*.. altho i'm not gonna see my darlings on Monday.. but PaKeFiNo is actually representing them to celebrate my birthday with me. Whenever i see it, i see them! thats really sweet rite?! In fact, PaKeFiNo is the earliest gift i received this year from my friends. 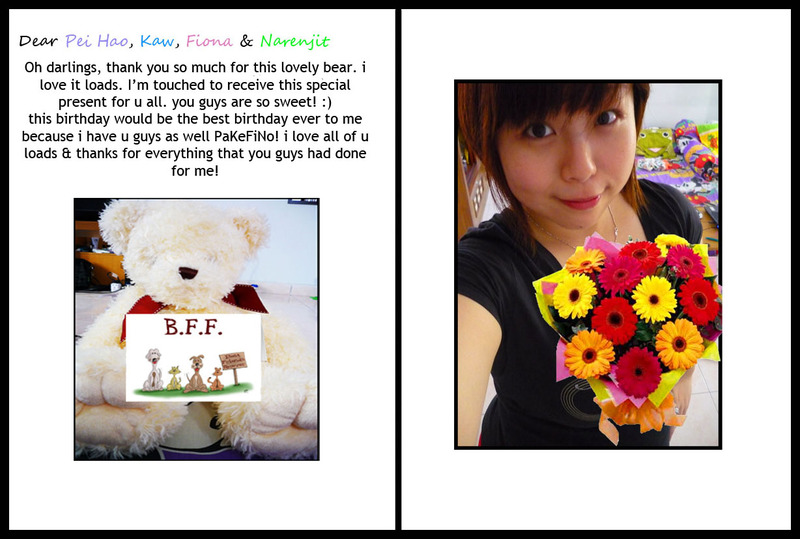 The 1st pressie that i received was from Mr. Baby Lee, followed by my parents then my dearest darlings! Oh Gosh.. im happy enough this year! i'm glad tat all the one that i loved didnt forget my big day! :) Thanks sweethearts, you guys wouldnt know how much it means to me?! Btw why i named my teddy as PaKeFiNo because P stands for Pei Hao, K stands for Kaw, F stands for Fiona and N stands for Narenjit. a, e, i, o & u are used to fill up the gap in between hence in the end, PaKeFiNo was formed. Hope they will like the card i made and the name i gave to my lovely teddy! 1 comments on "♥PaKeFiNo - an early birthday gift♥"